The St. Andrew's-Sewanee mountain biking team concluded its fall season over the weekend of November 7-8 in the state championship race for the Tennessee High School Cycling League. SAS hosted the race on its campus trails, with approximately 150 high school and middle school riders competing. Athletes raced multiple laps on the trails, ranging from 5 to 20 miles depending on race category.The course was the most physically demanding of the race season, and included technical rocky sections, a large grass section, and several challenging climbs. In the competitive junior varsity boys division, four SAS riders finished in the top ten, with junior Fritz Stine in 7th, senior Joshua Alvarez in 8th, junior Andrew Bachman in 9th, and senior Colburn Hassman in 10th.Stine and Alvarez also clinched 6th and 7th place finishes overall for the season. In the sophomore boys division, Matthew Mollica made a strong showing by finishing in 4th place, earning 3rd overall for the season.Sophomore Zhaoqi Zhang also turned in a solid performance for the team in 6th place, earning 4th overall behind Mollica for the season.In the freshman boys race, St. Andrew's-Sewanee was well-represented in the top ten.Aidan Smith and Evan Fox competed as 8th graders in the freshman race and earned impressive 5th and 10th place finishes, respectively.Alexander Milford worked hard for an 8th place finish, while Spencer Davis and Marshal Zhang improved their times over the season to finish strong for the Mountain Lions at home.Middle school riders Emma Diamond, Gabriel Pongdee, Jack Bailey, Eli Thompson, Logan Davis, Aulden Matheny, and Cole Palmertree rode hard and with spirit to represent SAS as true competitors. 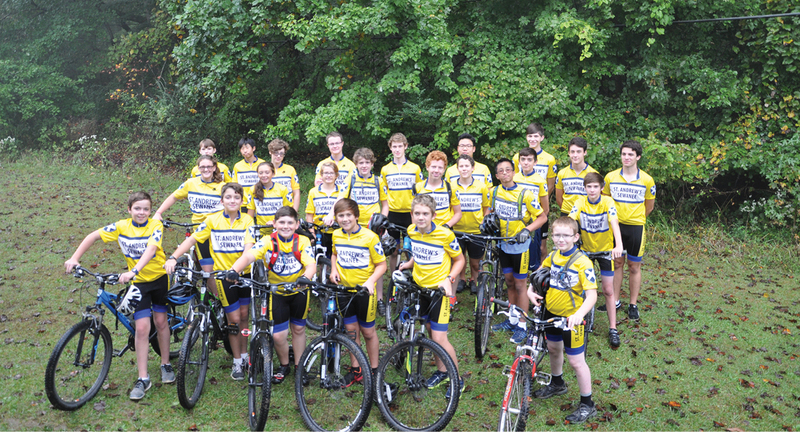 In final rankings for the Tennessee League's second race season, St. Andrew's-Sewanee earned second place out of 12 teams behind Marshall County (KY) High School.The SAS mountain biking team is coached by Speed Baranco, Beth Pride Ford, and Rob Bachman. The coaches are grateful for support from our team parents, the SAS community, and Woody's bike shop.